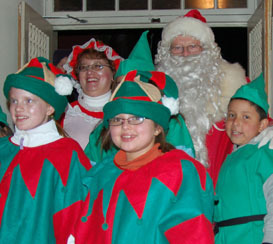 Every year, a few weeks before The Big Day, Santa and Mrs. Claus carve out an evening when they can whisk themselves from the North Pole to the Palace of the Governors in Santa Fe. There, Santa hears New Mexico children’s wish lists while Mrs. Claus spreads her own spirit of comfort and joy. This year, they plan to visit from 5:30-8 pm on Friday, Dec. 11, as part of Christmas at the Palace — a free, family event. In honor of their presence, the Palace will open its doors for free, serve hot cider and cookies and invite local musicians to spread the holiday cheer. In anticipation, Mrs. Claus graciously agreed to a little Q&A. Q. How long have you and Mr. Claus been married? A. Mr. Claus and I have been happily married for many, many years, too many to count. Q. You’ve been doing this job for hundreds of years, and for millions of children. What keeps the two of you going? A. I would not call it a job. Mr. Claus and I have been making children happy for hundreds of years it warms our hearts. It all comes from the joy of our surroundings – of course, not to exclude our hard-working elves. Q. Every year, you and the Mr. visit the Palace. Tell us some of your memories of past visits. A. Yes, we do come to visit the Palace every year and are looking forward to this year. When the children come to the Palace to visit Santa, they usually do not expect to see Mrs. Claus. The warm `hellos’ and smiles that I receive from children and their parents are so heartwarming when they see me. Most children like to touch me to make sure that I am real. I am asked if I am the real Mrs. Claus. One year, Mr. Claus was very tired from a long night at the Palace and one young boy was following us to make sure that we got back safely to our sleigh and reindeer. Mr. Claus went ahead of us and was clear out of sight. A few minutes later, the young boy looked up to the sky and noticed that the sleigh and reindeers had already left with Mr. Claus – and left me behind! The young boy saw Rudolph’s red nose way up in the sky and was very concerned, wondering what I was going to do for the night. I let him know that Santa would notice that I was not in the sleigh and come back for me. The young boy was so excited and ran off to tell his parent. Q. Do you have a message for the children of New Mexico? A. I would like to welcome the children of New Mexico back to the Palace again this year for another wonderful and exciting time of the year. I first met Tom Chavez in the early 1990s. He was director of the Palace of the Governors. I was a lowly reporter for The Albuquerque Tribune. The Palace still stands, but lately stands in the shadow of the far larger New Mexico History Museum. The Tribune? Well, let’s just be glad we still have the Palace. My memory of our first encounter includes the dark and aged offices that Chavez’s staff worked in, a motherlode of archival photographs that put my newspaper’s library to shame, and an undeniable excitement about a faded scrap of painting. Chavez told me the scrap was part of something called the Segesser Hides and, needing only a cub reporter’s curiously raised eyebrow for inspiration, launched into a tale of what it took to bring them back to their North American birthplace. Long held by a Swiss family named Segesser, the hides depict the 1720 Pedro de Villasur expedition against the French and their Native allies in present-day Nebraska. To folks like Chavez and the many, many volunteers who joined him in the quest to acquire the hides, it just seemed right that they should be displayed at the launch site of that expedition. And thus ensued years’ worth of international diplomacy that occasionally produced a huge segment, occasionally a scrap, occasionally nothing. But one big chunk is missing. It’s still in a vault, still in Switzerland, still under the ownership of someone still thinking it over. Way back when, Chavez promised me, time was on his side. He was, after all, younger than the owner of the missing piece (insert your own version of a knowing glance here). I liked his attitude. The sense of adventure, the air of mystery, the shadow of a scheme. Who knew that, one day, I’d be working at this same place (the dark and aged offices now replaced by bright, modern ones), walking past these same hides, sharing that same desire to someday see the hides made whole once more. This Sunday, Chavez will share some of his memories as former director of the Palace and retired executive director of the National Hispanic Cultural Center. The talk is called Chasing History: Quixotic Quests for Arts, Artifacts and Culture. It’s the kickoff to the Telling New Mexico Inaugural Lecture Series, a five-part collection of speakers versed in everything from Blackdom to Japanese internment camps to Navajo women. Tickets cost $10 and are still available. Buy them at the museum shops or outside the History Museum Auditorium before the lecture at 2 pm. Come early, at 1 pm, for a special reception. I’m betting Chavez talks about the hides and shares a few other behind-the-scenes tales of the people, personalities and adventures that lie behind the exhibits. Josef Diaz of the New Mexico History Museum is co-curator of Santa Fe Found: Fragments of Time, in the museum’s Palace of the Governors. We asked him a few questions about the exhibit. How did you come to be a Spanish colonial curator at NMHM? I received a masters degree UNM in 16th century Spanish Colonial/Postclassical Mesoamerican Art History. I worked at both the Museum of Spanish Colonial Art in Santa Fe and Casa San Ysidro, a historic house museum in Corrales. From there I was hired as the curator of Spanish Colonial Art and History at the New Mexico History Museum. As you sifted through the history of the early colonists and the Native peoples, what struck you about their lives? They had many hardships they had to endure and often their daily interactions with one another were not that different from ours. The exhibit includes what we’ve been calling Vargas’ cookbook. Tell us a bit about it and how it managed to survive 400 years. The cookbook in the exhibit is Arte de cozina by Francisco Martínez Montiño, a cook and writer of the Spanish Golden Age. His book was printed in 1611 did not belong to Governor Don Diego de Vargas. He did, however, have the same title in his personal library that he brought to New Mexico. The cookbook and the food fragments in the exhibit will help tell the story of the types of meals that were undoubtedly created within the walls of the Palace of the Governors during his tenure as governor. Montiño was chef to Philip II, and the book illustrates some of the luxurious dishes that were prepared in the royal kitchens. Some people take strict black-and-white, good-vs.-bad sides when assessing Spain’s early colonizations. What’s your take? When assessing Spain’s early colonizations, you must remember that it Spain was one of many European countries that colonized around the globe. Yes, early colonizers are guilty of unspeakable behavior but where they really worst than any other colonizers or conquering people in history? What do you hope people take away from this exhibit? Even though Santa Fe exemplified geographical remoteness and was thousands of miles away from any seaport, many people did possess luxury goods. Many of these items were from the Manila trade route, sometimes called “the other Silk Road,” and from other Spanish colonies that spanned the globe. Santa Fe was not as remote as many people think. Stephen Post is deputy director of New Mexico’s Office of Archaeological Studies (OAS) and has co-curated the New Mexico History Museum’s newest exhibit, Santa Fe Found: Fragments of Time, opening Nov. 20. We interrupted the tail-end whirlwind that always seems to accompany exhibit mountings to pester him with a few questions about the past that’s always beneath us, about some amazing tree rings, and about himself. How did you come to be involved in New Mexico archaeology? I moved to Santa Fe in 1977 and got a job washing artifacts at the Laboratory of Anthropology. Three weeks later I was working on the Chaco Wash and fell in love. History in the great outdoors; it couldn’t get any better. You were involved in the dig on the New Mexico History Museum site, which yielded something like 90,000 artifacts. Tell us about what was in that bounty, including a key find or two. Actually, the excavation team recovered about 800,000 artifacts and samples, and about 90,000 were from the 17th century. From the 17th century, we found the furrows of the governors’ earliest gardens, a light-duty metal working pit, and a lot of butchered sheep, goat and cow bone mixed with Native-made pottery sherds, mayolica from Mexico, and precious personal objects, such as earrings, crosses, and higas that had been lost for more than 300 years. What surprised you about the finds? Frankly, the volume of artifacts from the History Museum site was a bit overwhelming. Archaeologists often dig 2 by 2 m squares in levels 10 to 20 cm thick. In some these units, we were recovering more than 1,000 artifacts per level. There’s going to be a cross-section of a Ponderosa pine on display in Santa Fe Found. What’s significant about it? It’s amazing. The tree was in the yard of an OAS employee, Robert Turner, south of Santa Fe. The tree had died in 2004. So, Robert and Eric Blinman, our director, cut slices out of the stump. Eric matched the tree-ring pattern with known samples from Glorieta Mesa and estimated the time of tree birth. OAS volunteers counted the rings and learned that the tree was born in 1670. That means it witnessed 334 years of Santa Fe’s history before its death. Lots of people are interested in archaeology, and there’s so much to be found in New Mexico. What tips – and cautions – do you have for people wanting to try a little backyard exploration? If you have an archaeological site in your backyard, you want to leave everything in place. If you pick up an artifact, put it back where you found it. Where artifacts are found relative to one another is important. If you can’t preserve your site, call a professional archaeologist. Finally, if you want to learn more about archaeology and do it with fun people, join the Museum of New Mexico Foundation’s Friends of Archaeology. Santa Fe (Nov. 13, 2009) – When Santa Fe Found: Fragments of Time opens at the New Mexico History Museum on Nov. 20, futuristic technologies will give visitors new, close-up views of the past. Stephen Post, co-curator of the exhibit, worked with student interns from New Mexico Highlands University and former Los Alamos National Laboratory scientists brought on board by the Department of Cultural Affairs to devise new ways to present old objects, including the 400-year-old Palace of the Governors. Santa Fe Found: Fragments of Time combines historical documents with archaeological artifacts from several sites of early Spanish colonists to explore the founding of La Villa Real de Santa Fé, now celebrating its 400th birthday. Set appropriately in the Palace of the Governors, where colonists established their first government, the exhibit was curated by Post and Josef Diaz of the New Mexico History Museum. Some of the artifacts are too fragile for long-term exhibition; others, like the Palace, no longer exist in their original form. That’s where technology comes in. Using a portable laser scanner, Ralph Chapman and David Modl of New Mexico Virtualization LLC are producing a 3D model of the oldest radiocarbon-dated dart point from Santa Fe – a small artifact from New Mexico’s indigenous people that is more than 7,000 years old. The virtual model – an enlarged, rotating, three-dimensional image – will be displayed with the actual dart point. New Mexico Virtualization was formed last year by Chapman, former head of the Idaho Virtualization Lab, and two former Los Alamos Visualization Scientists, Modl and Steve Smith. The group had received a 2009 Venture Acceleration Fund grant from Los Alamos National Laboratory to develop their business; the grant supports the museum collaboration. The little basalt dart point that New Mexico Virtualization worked with will be on public view for the first time since it was discovered in 1995 by Post, deputy director of the New Mexico Office of Archaeological Studies. During the excavation of a much later hunter-gatherer campsite near N.M. 599, Post became intrigued by a dark streak in the bank of an arroyo and decided to investigate. Older points have been found outside the city, including Paleoindian sites in Santa Fe County that may date to 8,500 or 9,000 years old. This one, however, comes from the oldest radiocarbon-dated site found so far within city limits – a discovery that involved hand-removal of 14 metric tons of dirt. The exhibit will also feature an interactive 3D model of the 17th-century Palace of the Governors created by students Jessica Power and Daniel Atencio from the Media Arts Program at Highlands. The project is part of a DCA partnership that prepares students for careers as multimedia professionals in museums. Post said the project was extremely challenging and time-consuming because of sparse information about the Palace during the 17th century. The model is a visual representation based on data gathered during several archaeological excavations in the building and historical documents. The New Mexico History Museum is the newest addition to a campus that includes the Palace of the Governors, the oldest continuously occupied public building in the United States; Fray Angélico Chávez History Library; Palace of the Governors Photo Archives; the Press at the Palace of the Governors; and the Native American Artisans Program. The New Mexico History Museum/Palace of the Governors is a division of the Department of Cultural Affairs. For more information, visit www.nmhistorymuseum.org. Santa Fe (Nov. 3, 2009) – The New Mexico History Museum will receive the New Mexico Association of Museums’ Hewett Award on Thursday during the group’s annual meeting in Santa Fe. Also receiving a Hewett is Louise Stiver, retired senior curator of the History Museum, whose Fashioning New Mexico exhibit is on display through April 14, 2010. The awards are named for Edgar Lee Hewett, the first director of the Museum of New Mexico from 1909 until his death in 1946. Hewett taught anthropology at UNM and was instrumental in encouraging the development of small museums throughout New Mexico. NMAM bestows two yearly awards in his honor. The History Museum opened May 24 to blocks-long lines after 20 years of work by staff and supporters. Encompassing more than 500 years of New Mexico history, it combines artifacts, maps, photographs, films and interactive exhibits that range from Native peoples to Spanish colonization, the Mexican period, the Santa Fe Trail, outlaws, the railroad, World War II, scientists, hippies and modern-day New Mexicans. Less than five months after opening, the Museum surpassed 100,000 visitors, doubling the annual attendance of its predecessor, the Palace of the Governors, now the Museum’s largest exhibit. Stiver was also one of the editors of the book Telling New Mexico: A New History, along with Marta Weigle and Levine. The book, a collection of essays from 45 scholars and writers, accompanies the Museum’s core exhibit, Telling New Mexico: Stories from Then and Now. Stiver’s swan song, Fashioning New Mexico, cuts a swath across 150 years of New Mexico costumes and clothing – from weddings to operas, fiestas to inaugurations, baptisms to an ooh-la-la interactive exhibit on underwear. Prior to the History Museum’s opening, the collection lacked exhibition space with proper lighting and environmental controls. The collection’s emergence from the closet (so to speak) has proved one of the most popular aspects of the new museum. For information on the exhibit, as well as a selection of photographs, log onto http://media.museumofnewmexico.org/events.php?action=detail&eventID=407. The New Mexico History Museum is the newest addition to a campus that includes the Palace of the Governors, the oldest continuously occupied public building in the United States; Fray Angélico Chávez History Library; Palace of the Governors Photo Archives; the Press at the Palace of the Governors; and the Native American Artisans Program. The New Mexico History Museum/Palace of the Governors, 113 Lincoln Ave., is a division of the Department of Cultural Affairs. For more information, visit www.nmhistorymuseum.org. Santa Fe (Nov. 2, 2009) – The New Mexico History Museum today unveiled a new subscription lecture series to accompany the book, Telling New Mexico: A New History. Speakers for the five-part Telling New Mexico Inaugural Lecture Series will cover a range of topics – from the earliest Spanish colonists to Blackdom to Japanese internment camps to Navajo women. The series will be held in the New Mexico History Museum Auditorium. Each lecture costs $10; a subscription to all five lectures costs $40. For $100, participants will be named “event sponsors” and receive a paperback version of Telling New Mexico: A New History, autographed by the volume editors. To purchase tickets online (until 4 pm the Friday before each lecture), visit the Museum of New Mexico Foundation’s website at http://www.museumfoundation.org/tellingnm. Tickets can also be purchased at the Museum Shops in the Palace and the New Mexico History Museum. The series kicks off at 1 pm, Sunday, Nov. 22, with a special reception honoring Marianne O’Shaughnessy and her late husband, Michael O’Shaughnessy, who provided funding for the series, and Marta Weigle, editor of Telling New Mexico. The reception will be in the John Gaw Meem Community Room (enter through the New Mexico History Museum’s Washington Avenue entrance). Nov. 22, 2pm: Following the opening reception, Dr. Thomas Chávez, former director of the Palace of the Governors and the National Hispanic Cultural Center, on his current book project, a history of the Palace of the Governors. Jan. 31, 2 pm: Author Thomas Lark on the history of African-Americans in New Mexico; and the Rev. Landjur Abukusumo, president of the Blackdom Memorial Foundation, on the pioneers of the Blackdom community in Roswell. Special treat: The Afro-Gospel Praise Experience will perform a mixture of Afro-Latin rhythms and traditional gospel. March 28, 2 pm: Gail Y. Okawa, professor of English at Youngstown State University in Ohio, on Santa Fe’s WWII Japanese internment camps, including one that held her late grandfather. May 2, 2pm: UNM History Professor Ferenc Szasz on New Mexico’s role in developing the atomic bomb. Aug. 22, 2pm: Diné author Jennifer Nez Denetdale on the stories of Navajo women, from her current book project.